So, with GeoCommons you can export all the features from a dataset in GeoJSON format. This is very useful. Then can it be displayed in Openlayers? Why yes it can! I use the following strategy, wrapping the response with a little bit extra so that the GeoJSON format can read it properly. It is of course very basic in terms of styling, but it’s a start! Analytics library is completed, but not currently accessible to normal users of GeoCommons – hopefully it will be soon, if people want it. Filters can be applied to the map, so that attributes can be filtered out. Custom markers can be added to a map, and even animated ones work too! The GeoIQ developer blog has a developer orientated review of wha’ts new and there is a good overview of GeoCommons on the main GeoIQ blog too. Keep your eyes peeled on the GeoIQ Developer Blog over the next few days as the team adds some more posts about some of the technology behind it. The whole conference was okay, well organised, and well attended by fellow AGI Northern Group members. The soapbox – an evening even over beers – short 20:20’s but with the emphasis on ranting and comedy proved very popular, and was very amusing – keep an eye out for the videos when they come out! The free W3Geo unconference which was on the day before the main conference, and as Ed writes, had the more interesting talks and energy here. 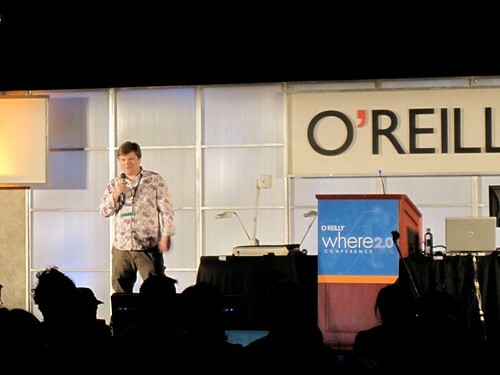 w3g had a number of fixed keynotes and speakers, which I think was a good idea – it allowed people to attend knowing that certain people would be speaking. Alas, I didn’t really believe it was promoted that well beforehand. The main conference had a number of interesting talks. The guys from CASA really do seem to be enjoying themselves. Survey Mapper was highlighted – essentially it’s an onlne survey application, but with, yes geography! It would be great to be able to allow the export of the results from a survey, and use this as a data layer in GeoCommons – to compare against any number of other datasets. They also showcased their work with Twitter – exploratory – one thing with pretty much all twitter map experiements is that people are so overwhelmed with the dataset, that the analysis, the task of generating information from this data tends to be overlooked. Most of the mapping done tends to show that, for the very first time, that people tend to live and do things in urban areas. ESRI were keynoting, but with a somewhat downbeat “why doesn’t anyone understand and use GIS” cry, with a call to promote the usefullness of GIS to decision makers. Nothing new here, but in these economic times, seemed to imply that GIS budgets were being hit hard. Here follows a blog post that’s written like a press release, sorry. A group of volunteers from around the North of England on Saturday 15th May 2010, will attempt to map the entire North Yorkshire town, from every street, bridge, footpath and chip shop – in order to create a free and open map of the town. All welcome, no experience or technology required! The Association for Geographic Informations Northern Group and the OpenStreetMap Foundation are running a mapping party – a cross between an informal fieldtrip and a hands on workshop. OpenStreetMap is the wikipedia of maps – it’s open, free and anyone can edit and contribute. 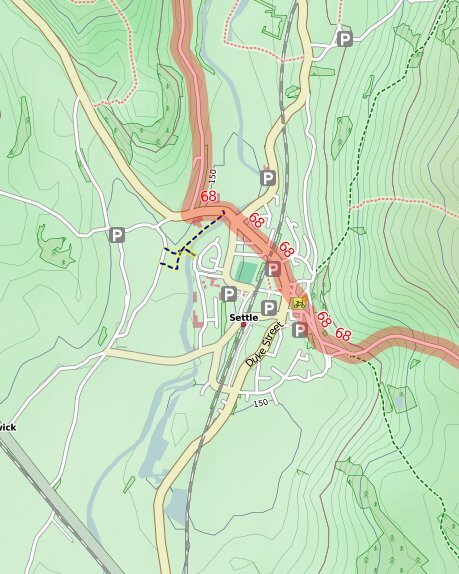 With the announcement of the Ordnance Survey releasing a lot of mid scale mapping data for free, the chances of having a top notch detailed map is greater than ever. By making a free and open map, anyone can edit and correct details, making sure the map stays up to date and relevant. It’s also free to copy and change and distribute, which is impossible to do with almost every other map. Anyone and everyone is welcome to attend, families and children are also welcome! No previous experience needed, and no GPS units needed either. GPS units will be available for people to borrow, but people can contribute a lot by using a pen and paper. It’s an open organisation with no membership requirements. OSM Slides At AGI North. Yesterday for the AGI Northern Group I talked about OpenStreetMap, with a focus on how to use, contribute. About the tools, services and people that surround the project. There were two talks, an OSM talk and a MapAction talk. We had a good turn out. It touched upon the new Ordnance Survey OpenData and it’s impact on OSM, and how we may change the way map in the UK, and then I talked about Haiti too – how what we did “changed disaster response forever” – but only briefly as Anne-Marie Frankland from MapAction gave a great presentation about her work in Haiti, she was one of the first to deploy to the area. Really astonishing and inspiring work they did over there. Hope to be able to see those slides later. In case you were wondering, MapAction send volunteers out at the very early days of a crisis to provide mapping support and services to responders. During Haiti they produced maps, installed data on GPS devices, trained search and rescue teams how to use them, produced search and rescue sector maps, locational awareness maps, helped identify locations for camps, and a whole host of other things, with not much sleep. WhooMS is a tiny public WMS server for those people who have a GeoTIFF and need someplace to serve it as WMS. I wrote it a while ago, but now its running for all to use. It’s written in Ruby, using the Sinatra Web Framework, which basically means it can all fit neatly on one file. It uses Ruby Mapscript to read the uploaded GeoTiff and serve it out to the world. Main caveat: when the disc space gets full, the older files will be deleted to fill up space. In June, at a special Reuters AlertNet workshop, designed for (mainly UK based) humanitarian organisations, I presented about OpenStreetMap and was on the panel for a discussion. The talk was an introduction to OSM, followed by announcement of the Africover import from DevelopmentSeed, a detailed look at Gaza and a talk about the Humanitarian OpenStreetMap Team. The theme of the day was “looking at how the aid world can use maps to communicate, advocate and plan for disasters.” – and was a general and gentle introduction on how geographic information, mapping and maps can help “showcase their work, advocate around areas of need and plan during emergency responses”. Organisations such as Mines Advisory Group, UNHCR, Save the Children were present, and on the panel there was Nick McWilliam from MapAction, Vincent Casey from WaterAid, Herbert Hansen from KeyObs and me representing OpenStreetMap. Attendees could tweet us questions, and one was asked about “What moral obligations do data collectors have when they encounter human rights abuses”….The moral maze being, by keeping quiet and collecting data, the map can be completed, and possibly help those in need. By making noise, the map may not be completed and thus, less help may be applied. The event was webcasted, and archived, and you can access it by clicking the image at the end of the post summarising the mapping workshop from AlertNet. You may need to register quickly to view the video. Where 2.0 & Free our old maps! Well over a month ago I went over to the Bay area for Where2.0 and Wherecamp 2009. Presented at the Ignite Where on the Thursday evening, after the workshops, about Map Warper. Map Warper Ignite Slides on slideshare. I’m near the end at 34:15 minutes in. In fact, http://where.blip.tv is where to go for all the presentations. Ignite format was fun, the lights were quite bright on stage so it appeared that I was scowling! Scowling, and not from slagging off the Ordnance Survey too. Rather I think the OS deserves the love that it’s maps generate – it’s the people who use them that deserve the criticism. Councils have old map archives. Councils have Ordnance Survey mapping. Councils have statutory obligation to look at contaminated land, and the history of land for planning and development etc. Councils use OS mapping to georeference and rectify old maps using OS mapping. Often at great expense, sometimes outsourcing to other countries. Resulting rectified maps are derivative works from the OS, and cannot be shared, or given away for free because of this. As a response to this, and knowing that all the councils probably had digital collections of (unrectified) out of copyright maps, I am proposing “Free our Old Maps” project. Lets use crowd sourcing techiques to free these old maps get layers and layers of old historical maps for the UK. The rest of the conference was good. Wearabale Haptics talk captured my imagination. OpenStreetMap was a given, no longer a new thing that people didnt know about, it was pretty much mentioned casually throughout. The Stamen fellas did a nice workshop with mapnik, cascadenik and OSM data, which was very well attended. Also over from Leeds was my buddy Mohsin, fresh out of Leeds Met, and presenting at Wherefaire his Snapture project. Using Leodis images, location on a mobile app, we can view Leeds through time. V. cool project.